After spending an appropriate amount of time in mourning following the series finale of Fixer Upper, we eagerly anticipated any and all new projects from Chip and Joanna Gaines. 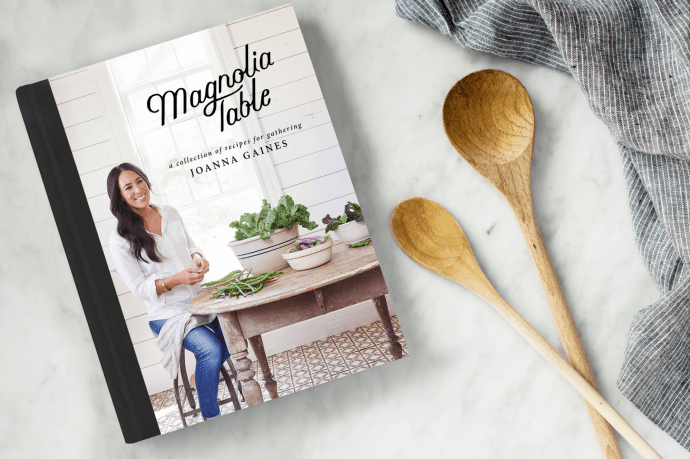 And luckily, we didn’t have to wait long: Joanna’s much-anticipated cookbook Magnolia Table just launched, and our stomachs are ready. Gaines has been sharing tidbits of information, behind-the-scenes shots (we would honestly pay to be in the room during the brown pie and mac ‘n’ cheese tasting that’s taking place in this Instagram post), and even select recipes on her blog ever since. From green beans amandine to spiced pecan pie, the book runs the gamut from healthy to hearty—though the main focus, of course, is on family-style dining. Truly decadent dishes that even the most novice chefs can easily master and recipes that won’t keep you laboring in the kitchen all day are the focus. And as we learned at a recent lunch held in New York City by none other than Chip and Jo themselves to celebrate the launch, the book is really all about creating family moments. As a result, pretty much every item in the cookbook has family ties. The biscuits—which we tried at the aforementioned lunch and can confirm are truly buttery perfection—are Chip’s favorite. They also may or may not have been the impetus for the couple’s eponymous restaurant, which recently opened in Waco. “For the past year or so, I have spent almost every Saturday morning perfecting this biscuit recipe, and we finally have one that has the seal of approval from Chip and the kids. If you’re able to visit us here in Waco, be sure to stop by the restaurant and try them. Or if you can’t come here, grab a copy of the cookbook and make a batch at home,” says Gaines on her blog. Besides the biscuits, other standouts from the Magnolia Table restaurant feature in the cookbook. So, for those of us who can’t make it down to Texas to dine on comfort foods like the Gaines Brothers Burger and farm eggs benedict, the book is a serious godsend. “Perfection is kind of hard to achieve,” joked Joanna at the lunch… which might be true, but these recipes definitely come close. Order your copy of Magnolia Table today and get cookin’. This story was originally published on October 2, 2017. It was updated with new information on April 24, 2018.